The qualification is a CYQ Level 2 Certificate in Fitness Instructing. This is one of the most popular health and fitness qualifications, gaining a CYQ Level 2 Certificate in Fitness Instructing is a great way to start your career in the Health and Fitness Industry. This qualification is recognised by The Register of Exercise Professionals (REPs) at Level 2 and widely respected by employers throughout the industry in the UK and abroad. Our sports apprenticeships are fully funded work based learning courses. Candidates spend time in lectures and in one of our health clubs gaining crucial work experience to prepare them for the health and fitness industry. Our current apprentices started in October 2008 and have all taken their theory exam already, some passing at 100 %. They are all due to take the practical and should be fully qualified by the end of February. 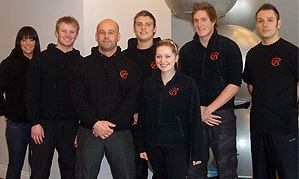 Two of them have already gone on to start training for their Level 3 Certificate in Advanced Fitness Instructing. The course is 16 hours per week and takes approximately six months to complete. Applicants would spend one day per week at their nearest club shadowing instructors and gaining valuable work experience. The remaining hours are spent at the training college in Bexley and homestudy. Reynolds Apprenticeship Courses are government funded and therefore require a basic criteria for candidates. However, candidates of all ages are welcome to apply and part-funding may be available. Reynolds can award full scholarships to individuals who do not qualify for the government funding but can prove their outstanding commitment and enthusiasm in the industry. “I have been weight training for twelve years now & always wanted a career as a personal trainer, but always assumed I’d left it too late in life to pursue. Reynolds has given me the opportunity to realise my dream. I am about to complete my CYQ level 2 qualification, and begin my CYQ level 3. For more details please visit our Sports Apprenticeships page.